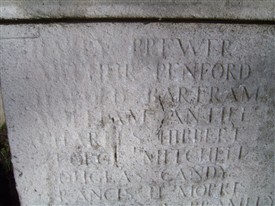 In January 2012 Mr Brewer of Mansfield came to the newly-reopened Mansfield Library to find out about a relative, Harry Brewer, whose name appears on the war memorial at St Mark's Church on the corner of Nottingham Road and Portland Street. It was assumed that he'd been in the Sherwood Foresters, probably killed on the Somme in 1916. A search using Ancestry.com, available free in all Nottinghamshire libraries, revealed far more, enabling a proper reconstruction of the unfortunate man's brief but eventful life. In the 1901 Census we find the 6-year old Harry living just around the corner from the church where his name would one day be memorialised, at 36 Belvedere Street. 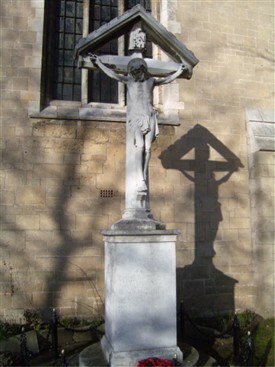 His father George, originally of Brailes, Warwickshire, was a miner, married to Mary from Mansfield. They had two daughters and three sons, the eldest, 15-year old George, already working as a 'Buncher' in a cotton mill. By the time of the 1911 Census only three children remained with their parents at a new address, 47 Duke Street (today part of Commercial Gate). Now 16, Harry worked as a 'cotton Twister', the same job as his 56-year old aunt Emily, whose name is badly mis-spelt [Emmaley] on the form filled in by her brother-in-law! (This census has just become available on Ancestry.com and will prove invaluable to all WW1 researchers). Thus far it might easily be conjectured that Harry Brewer continued at the cotton mill in Mansfield until called up and killed in the war a few years later; but there remains a much more interesting twist to his story which was completely unknown till now. Ancestry.com also enables us to check Passenger Lists from enormous numbers of ships that sailed in the last two centuries. 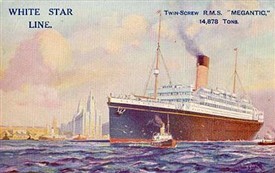 From a search there it was discovered that, aged 18, he emigrated to Canada, arriving in Quebec aboard S.S. Megantic on 21st May 1913, among a long list headed BRITISH SETTLERS. Interestingly, his occupation is now recorded as 'Electrician', something he may have learned about and become qualified in through evening classes after a day's cotton twisting? When England declared war on Imperial Germany in August 1914, British dominions, including Canada, were also automatically involved. Before forming their Expeditionary Force, the Canadians had only had a 'Permanent Active Militia' of about 30,000 for home defence. We learn from his Attestation Paper that Harry Brewer had already joined that when he volunteered for the 'Over-Seas Expeditionary Force' with a Regimental number of 7732. Although there is no known photograph of him, this document does include his signature and a physical description which tells us that he was 6 feet tall, of a fair complexion with blue eyes and light brown hair. His mother, presumably now a widow, still living at Duke Street back in Mansfield, is given as next-of-kin. 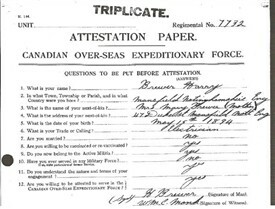 Since his Attestation is dated 22nd January 1915, Trooper Brewer must, after some initial training, have been in France for much of the last three years of his life. He would certainly have been allowed leave to return and visit family in Mansfield during that time. Unfortunately the final document that refers to him, also found on Ancestry.com, is a record of his death on 24th March 1918. It will be noted from this that he was a member of the Canadian Cavalry [Brigade] in the RCD [= Royal Canadian Dragoons]. Under 'Rank' someone has taken the trouble to cross out the typed 'Pte' [Private] and change it to 'TPR' [Trooper]. Repetition of the Regimental Number 7732 confirms that this is our man. 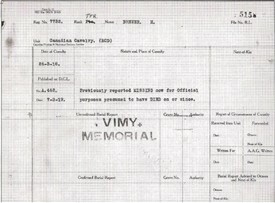 Tragically he has no known grave, though the card is prominently stamped + VIMY + MEMORIAL. 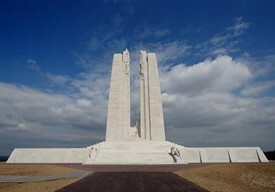 His name does indeed appear on the great monument to the Canadian dead of the First World War which lists all 11,825 of them and can be inspected online. With his electrician's skills one might have thought that Harry Brewer would have been a signaller or something more specialised than a cavalry trooper. Although the war was to continue nearly another 8 months after his death, he was unlucky since only 200 Canadians had been attached to the 3rd British Cavalry Division the day before he was killed near the River Arve, Picardy. On 21st March the Germans began their initially successful Ludendorff Offensive. They smashed through the weakest section of Allied Lines and the 3rd Cavalry Division had to form and move quickly to try to plug the gap. Between 23rd and 26th actions were fought at Cugny, Villeselve, La Neuville-en-Beine and Beaumont-en-Beine. Harry Brewer must have died in one of these engagements, a few days before the rest of the Canadian Cavalry Brigade arrived and made a successful counter-attack at Moreuil Wood. 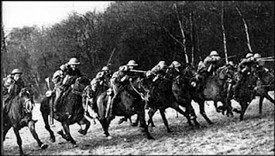 Although this halted the German advance, it was still costly with horsemen encountering machine guns and consequent heavy casualties. His next-of-kin would have been informed. This page was added by Ralph Lloyd-Jones on 20/01/2012.